Although men’s formalwear doesn’t have nearly the variety of styles that women’s fancy dresses do, you can still tailor the look. What looks better than a well-cut jacket and a pair of pants that hang from a guy’s hips just the right way? Tuxes can vary in the color and fabric (powder blue velvet tuxes were popular in the ’70s! ), the width of the lapels, the placement of the buttons, and the length of the jacket. Make it taper at the waist. Show the cuffs of the shirt. Men usually wear a vest under a tux jacket. Create a vest the same way you draw the jacket — just don’t draw the lapels or sleeves! Add a V shape below the chin to mark the top of the shirt collar. For the jacket’s neckline, draw a deep curved line that starts where the neck meets the shoulders. The curved line forms the inner edges of the jacket’s lapels. Add in lines for the shoulders and draw triangles below the chin on the V shape. The triangles form the shirt collar above the jacket. For an off-center jacket opening, draw a line coming down from the right side of the curved neckline and ending on the left side of the body for an off-center jacket opening. Add two buttons. Draw buttons on the right of a buttoned dinner jacket. Angle in the sides of the torso to transform the lines from the body’s outline into the jacket’s side seams. This creates the sleek, fitted look. Use angled lines along the jacket opening to draw in the one side of the tuxedo’s notched collar. Add in a jacket sleeve that ends at the wrist but lets the shirt’s cuff peek out. Draw the other side of the notched collar and the other sleeve. Add in small slash lines on each side of the waist for pockets. Finish with a little shading. Keep tuxedo shirts simple. Take a look at some photos of tuxedos from the ’70s. You won’t believe how much the ruffled shirts distracted from the lines of the jacket. A perfect jacket deserves a sleek and elegant pair of pants. The secret to tuxedo pants lies in the fit; baggy or too tight pants just won’t do. Map out a pair of pants around the male figure. Dress pants fall in a clean line from the hip; they don’t taper. The bottom of the pants hits well below the anklebone. Don’t draw flared pants unless you want your male figure to look outdated. 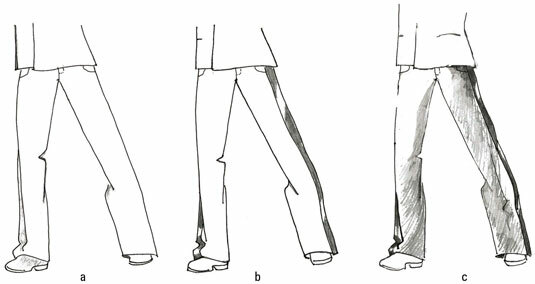 Draw the tuxedo stripe running down the side of the pants leg by adding a line parallel to the outside seam. Tuxedo pants typically have a stripe of satin going down the side of the pant leg. Shade to show lights and darks in the sheen of the fabric and the shine of the stripe. Many guys can really carry off the look of a bow tie. Although some men choose to wear a necktie with a dinner jacket, why mess with a classic? Sketch the head, neck, and shoulders of a man. Sketch in the pointed shirt collar using two curved triangles at the base of the neck. Give the triangles a bit of shape to reflect how they lie against the body and curve around the back of the neck. To make the tie’s knot, draw a tiny circle in the center where the collar meets. Draw three lines coming from one side of the circle. The top one goes up at an angle, the middle one is short and straight out, and the last one angles down. Copy these lines on the other side of the circle. The top and bottom lines represent the top and bottom of the bow tie. The center line shows the crease in the tie as the fabric comes out of the knot. Make sure the size of the bow tie you draw isn’t too big; you can run into clown issues. Finish by connecting the top and bottom lines on each side of the tie to create the finished and formal bow tie.